You might be wondering why Iâ€™m posting so much Microsoft stuff lately. It primarily because theyâ€™re coming up with so much innovation this year that its really hard to pass up on anything. And if theyâ€™re able to market even half of these research projects, weâ€™d be well on our way into the digital interactive world we saw in futuristic movies like Minority Report. Long Zheng originally shared this video on his blog but I had some issues streaming it so I downloaded and uploaded it to YouTube. The Video shows off a prototype of a futuristic wall we can have in our homes and offices. 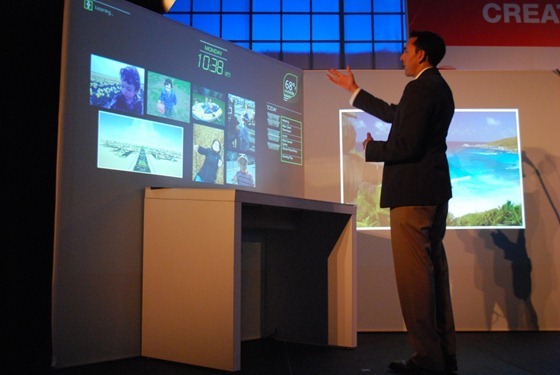 It uses technologies like interactive wall displays, Microsoft Surface and Project Natal. You can interact with objects on screen via the Surface table or with your voice and gestures. The system also has a digital assistant which features voice recognition and advanced A.I., something which was also demoed in the Milo demo for Natal. I guess Microsoft were really serious when they said Natal would also be available for the PC. You can also hold up objects to the system and have them automatically scanned. Another useful feature is interactive collaboration with coworkers around the world, plus Bing Maps 3D and Virtual Earth integration. You can actually view 3D models of places which change perspective as you move in front of them. Technologies like Microsoft Photosynth can be of use here as well. The video clearly shows that the possibilities are endless and we already have the technology to make this happen, which includes OLEDs, Natal and Surface. Here is an older video which shows off Microsoftâ€™s perspective of 2019. See how much of this tech can you relate to in there. Ran 14 queries in 0.154 seconds.